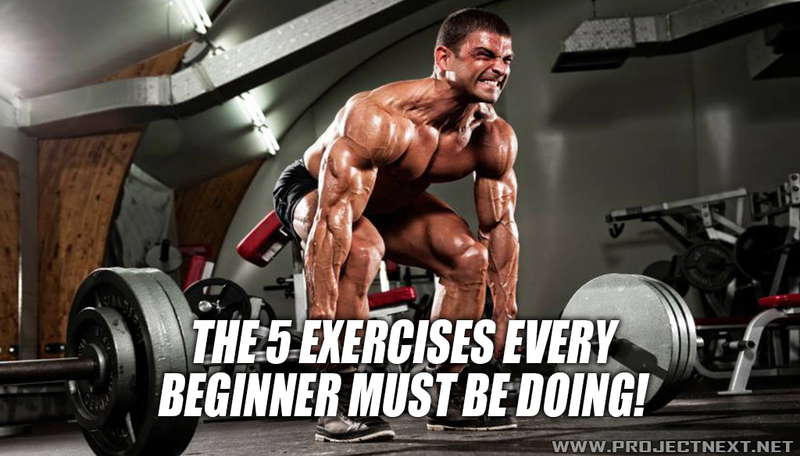 The 5 Exercises Every Beginner Must Be Doing! Posted byadmin	 3. February 2015 Leave a comment on The 5 Exercises Every Beginner Must Be Doing! Whether you’re just joining a gym for the first time or you’re determined to finally get in shape, there’s five exercises you must be doing at the gym each week. While the glossy magazines and bodybuilding sites are barraging you with isolated muscle exercises, beginner fitness goers need to focus on one thing. The deadlift is an excellent movement for overall body development. I firmly believe that the deadlift and the squat are the two most important exercises you can do at the gym. The deadlift primarily works the muscles of the lower back, abdomen, quads, hamstrings and glutes. As you can see it works a bundle of muscles. The deadlift feels awkward to new lifters, and takes little bit of time to perfect the technique. Start out with just the bar or a very light weight until you have your technique down cold. The squat is another great full body exercise that places it’s main emphasis on the quads and the glutes. Squatting also works your hamstrings, calves and lower back. When doing squats make sure you start with a small amount of weight and work on your form. Also, no matter how easy the Smith machine makes squats, do NOT use it. The Smith machine promotes an unnatural course of movement and several things can go wrong including improper knee flexion and also lower back problems can occur because of foot positioning. Learn how to properly squat with a bar in the cage and you’ll see some big improvements in your muscle gains. The bench press is a great upper body exercise for building size and strength. The bench primarily works your pec muscles as well as the delts, triceps, serratus anterior and a few other smaller muscles. Bench pressing, along with pullups really helps to build your upper body. Make sure you are using a spotter when you decide to up the weight and start doing heavy weight/low rep combinations. If you don’t have a spotter, or just want to switch things up every few sessions, using dumbbells is a great way to work your stabilizing muscles as well. Dumbbells force you to stabilize and balance while a barbell is evenly weighted and provides a much more uniform movement. The pull up is a great test of upper body strength and endurance. It is hands down the best compound pulling exercise you can do. The pull up mainly develops the lat muscles but also involves many other other muscles like the biceps, triceps, delts and chest muscles. Pull ups can be done in many different ways, including weighted pull ups, one armed pull ups and kipping pull ups. Adding weight to your pull ups is a great idea to really build strength once you are able to do a decent number of pull ups. The shoulder press is the single most important exercise for developing your shoulders. When standing and performing the lift the shoulder press also works your arms, back, abs and obliques. This lift can also be done with dumbbells which helps work the stabilizing muscles of the body, especially in your core. The five exercises we went over are hands down the best way to build strength and muscle for a beginner workout. However, you must workout with a high intensity if you want to see results. Most people think they are working out hard, when they’re really just giving it a mediocre effort. A hard workout should be difficult to complete and you should be struggling on the last few reps of every set.